Air embodies Nike’s endless desire to dream. Decades ago, we harnessed this shape-shifting element to forever change Nike, and to take those who put it beneath their feet to places they never thought possible. By capturing air, Air captured us. Today, the spirit of Nike Air still drives us to first imagine, and then create tomorrow. AIR MAX 1 WHITE 'JUST DO IT' PACK In 1988, one of the world's most recognisable slogans was coined. It was an ode to fitness and courage that has since inspired athletes across the globe to run faster, jump higher and push past their potential, regardless of the obstacles in their path. This year, the tagline turns 30.The ‘Just Do It’ pack celebrate the anniversary, where multiple Air models have been designed with the iconic slogan. the first shoe to put innovation on full display. Showing the world the Visible Air unit, which gave birth to a franchise that forever altered the course of sneakers. The shoe that started it all. 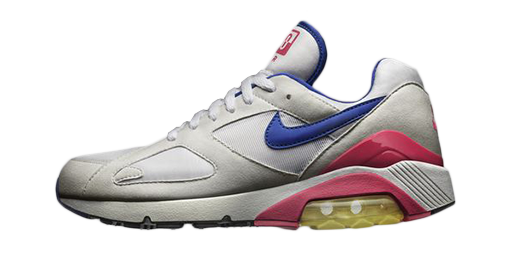 The Air Max 87 was the first shoe with visible Nike Air. The primary developer on the shoe was Mark Parker and the designer was Tinker Hatfield, an all-star cast by all accounts. At the time, Nike Air was nothing new. Introduced in 1978 in the Nike Air Tailwind, the "Air-Sole" unit was hidden in foam. Many people thought the idea to make air visible was outlandish but Hatfield and the team pushed forward and the Air Max '87 was born. The Nike Air Max 90 was an evolution from the original 1987 Air Max with updated features including a bigger visible air window, a flex groove outsole and an eye-catching shade of red that highlighted these updates. The shoe's radiant shade of red, would later become known as "infared." 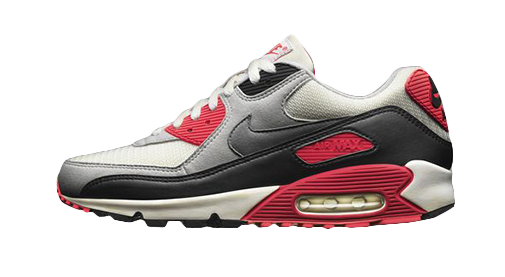 The color remains synonymous with the Air Max 90. 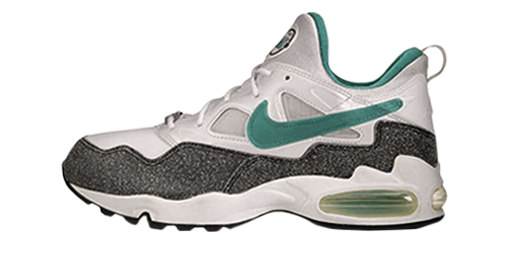 This installment of the Air Max family featured a larger volume of Nike Air than its predecessors. However, its fluid aesthetic that evoked forward motion was the defining feature. The Air Max 180 was born from the collective minds of Tinker Hatfield and Air Force 1 designer Bruce Kilgore. The two legends set out to make the Air Max unit visible from the outsole to the midsole, highlighting 180 degrees of cushioning. The upper featured a new stretch dynamic inner sleeve that flexed with the foot while the molded heel counter provided support. The forefoot grooves were an early experiment in natural motion. Breakthrough aside, it was considered heavy and offered less-than-desired transition. 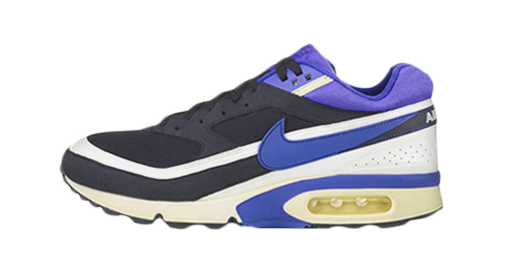 In 1991 Nike released two pinnacle Air Max products the Air Max 180 and this Air Max BW (Big Window) in Fall 1991. Like in the Air Max 90, the Visible Air heel and encapsulated forefoot air in the Air Max BW resulted in a heavy but comfortable ride. The shoe's moniker "Big Window" is due to the enlarged visible air window. 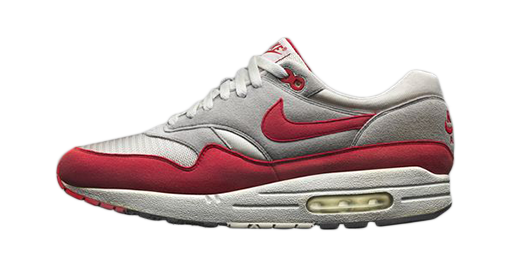 A neoprene liner and the first fully-visible heel air wedge gave this 1993 Nike Air Max its unique look and style. Using the Air Max 90's flex groove outsole. Tinker Hatfield pushed the visible air bag to the limit with the Air Max 93. Tinker Hatfield created the Air Max 93 to be an artistic celebration of Air technology. The blow-molded 270 degree cushioning unit was visible around the entire heel would be affectionately dubbed “the bubble." The precision-engineered Air-Sole was inspired by plastic milk jugs, created completely new standards of cushioning and became the cornerstone for visible air. Ride is defined as the athlete’s perception of how a shoe feels from an overall performance standpoint when it makes contact with a running surface. The components of ride include flexibility, transition, weight and overall comfort. 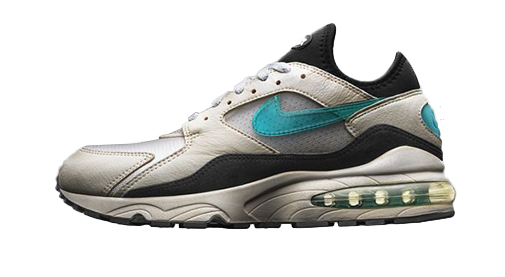 The Air Max2 is included in Nike’s history of ride because it was the first dual pressure heel bag in full length polyurethane. The result was elevated center heights and added weight. 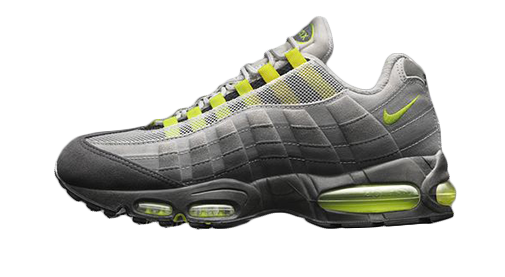 The stylish Nike Air Max 95 earned praise for its look and comfort and was the first shoe to incorporate a visible forefoot air bag. This new approach to cushioning brought runners increased comfort and support with dual air units. The flex groove pattern and a higher, colored midsole were also firsts for this Air Max. These traits drastically departed from traditional running shoe designs. The silhouette was inspired by the human body with the midsole representing the base of the spin, serving as the backbone of the design. Nylon eyelets represented the ribs, while the upper's layered panels and mesh symbolized muscle fibers and flesh. 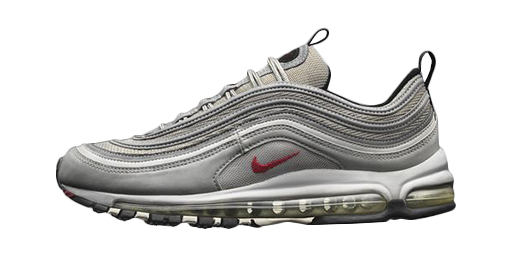 The Air Max 97 was the first shoe to use a full-length, dual-pressured air bag in full-length polyurethane. This resulted in a heavier shoe. Starting with silver the fluid design took inspiration from Tokyo's lightning-fast bullet trains. Reflective piping gave the Air Max 97 a look that amplified in the right light. The shoe design fit in well during this period where music, movies and style adopted the maximalist approach. The shoe has since become an era-defining design classic. This is the second Air Max release of 98. The Air Max 98 introduced Tuned Air to the Nike Air Max. This Spring release featured a slightly different upper design and colorway. 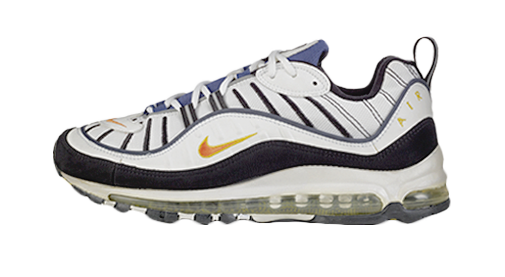 Like the Air Max 97, the 98 featured full-length Max Air technology. The two lace loops at the forefoot were designed to provide optimal fit. 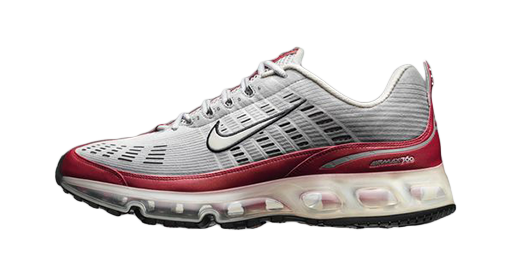 The revolutionary Air Max 360 launched in 2006. 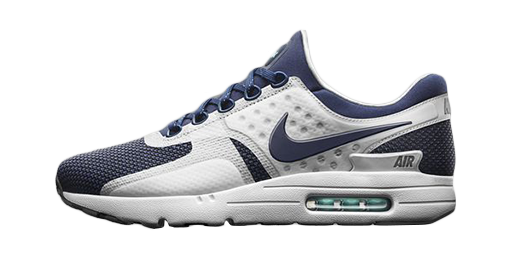 Its design utilized visible Max Air throughout the shoe’s midsole. 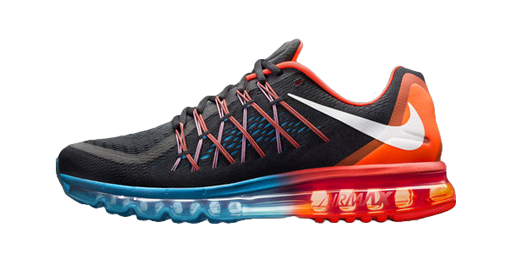 In 2015 the Air Max line expanded yet again with the Air Max 2015. The update included Flywire tchnology as well as elevate features from the 2014 version. The seamless mesh upper got lighter and more breathable. And new features included an internal bootie, and a sculpted Cushlon midsole. The Nike Air Max 2015 Men’s Running Shoe puts plenty of soft, flexible cushioning between you and the unforgiving ground for exceptional comfort throughout your run. Nike Design Director Graeme McMillan came upon an old sketch by legendary designer Tinker Hatfield that pre-dated Hatfield’s iconic Air Max 1 model. According to Hatfield, the sketch was literally ahead of its time. The key detail of this unrealised trainer is the visible Air Unit that sits on the heel, for the upper Tinker used the Sock Racer technology and added support with an external strap that wraps around the heel.